After three days and 219 hands on the official final table, Event #55: $1,000 Tag Team No-Limit Hold'em has come to an end. 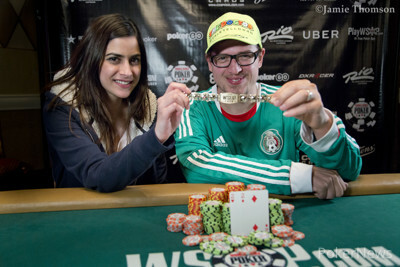 Giuseppe Pantaleo and Nikita Luther have been crowned as the winners, taking two coveted WSOP bracelets and the first-place prize of $175,805 to share between them! The 2018 edition of this event broke all records as 1,032 teams entered on Day 1 to have a shot of following in former champions Aditya Sushant & Nipun Java's footsteps. These are Pantaleo's and Luther's first bracelets and the biggest career cash ever for Luther. For Pantaleo, this is his third-biggest cash ever and his second biggest here at the WSOP after finishing in 6th place in last year's Little One for One Drop. "I usually have my basic strategy and foundation," said Pantaleo. "But if there was a closer pot, you don't want to spew and feel guilty to your teammate. And also, the other teams will not want to bluff as much, only a few people were going for it on the rivers. It makes a difference; people bluffed less." Team Moore (Thomas Moore - Norman Straughn) would become the official final table bubble when their ace-nine couldn't win against the ace-queen of Ikeuchi. After 58 hands of nine-handed play, Loni Harwood would be eliminated in ninth place when her queen-jack couldn't win against the jack-eight of Gabriel Neto. Harwood and fellow teammates Haixia Zhang and Kelly Minkin headed to the payout desk to collect $12,700 to divide between them. The hand right after that, Ikeuchi took care of Adam Lamphere and teammates with ace-eight against Lamphere's queen-ten. Both hit a pair on the flop, but Ikeuchi's was bigger. Team Neto's Gabriel Neto ran queen-jack into the ace-trey of Manig Loeser to finish in fifth place. Hand #183: Giuseppe Pantaleo raised to 300,000 from the small blind and Manig Loeser called in the big blind. The flop came , Pantaleo bet 165,000 and Loeser called. They both checked through the on the turn and the on the river. Loeser showed to win the pot. Hand #184: Loeser completed the small blind and Kazuki Ikeuchi opted to check. The flop came and Loeser bet 100,000. Ikeuchi raised to 325,000. Loeser checked out Ikeuchi's stack and then decided to shove. Ikeuchi called immediately for the 2,165,000 he had in front of him. Ikeuchi had flopped two pair and Loeser held top pair with the queens. The rest of the board was completed with the on the turn and the on the river. No help for Loeser and he was left behind with almost 1,200,000. Hand #177: Giuseppe Pantaleo called in the small blind, and Manig Loeser checked. On the flop Loeser folded to a bet. Hand #178: Loeser called in the small blind, and Kazuki Ikeuchi raised to 225,000, which was called. On the flop Loeser check-folded to a 200,000 bet. Hand #179: Loeser raised to 225,000 on the button, Ikeuchi three-bet to 700,000, only to see Pantaleo four-bet all in, which got both his opponents to fold. 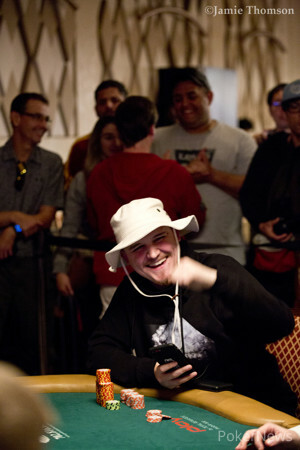 Hand #180: Pantaleo raised to 300,000 in the small blind and won the pot. Hand #181: Pantaleo raised the button to 200,000 and folded when Ikeuchi moved all in. Hand #182: Ikeuchi called in the small blind, and Pantaleo moved all in, which took down the pot. Hand #172: Manig Loeser called in the small blind, and Kazuki Ikeuchi checked the big blind. The flop came down , and Loeser's bet got a fold. Hand #173: Giuseppe Pantaleo got a walk in the big blind. Hand #174: Ikeuchi raised to 225,000 on the button and Loeser called in the big blind. Loeser check-called a 150,000 bet on the flop before both players checked on the turn and again on the river. Loeser showed for a pair of fives and Ikeuchi won the pot with for a pair of sevens. Hand #175: Pantaleo raised to 200,000 on the button and won the pot. Hand #176: Ikeuchi called in the small blind, and Pantaleo got his opponent to fold after he moved all in. Hand #167: Manig Loeser raised to 225,000 from the button but nobody called. Hand #168: Giuseppe Pantaleo completed his small blind and Loeser opted to check. They both checked through the flop to the on the turn. Pantaleo check-folded to Loeser's 175,000 bet. Hand #169: Pantaleo raised to 200,000 from the button and Loeser called in the small blind. They both checked again on the flop to the on the turn. Loeser bet 260,000 and Pantaleo folded. Hand #170: Kazuki Ikeuchi completed his small blind and Pantaleo checked. Pantaleo folded when Ikeuchi bet on the flop. Hand #171: Ikeuchi raised to 225,000 from the button and Loeser called in the big blind. They both checked the flop and when the came on the turn, Ikeuchi folded to Loeser's bet of 230,000. Hand #162: Giuseppe Pantaleo raised from the small blind to put Manig Loeser in the big blind all-in and Loeser called for the 1,540,000 he had in front of him. The board ran out , they both flopped a pair but Loeser's higher pair of aces held on all the way through the board to double him up. Hand #163: Pantaleo raised to 200,000 from the button and both Loeser and Kazuki Ikeuchi folded their blinds. 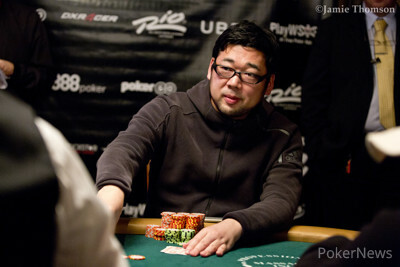 Hand #164: Ikeuchi completed his small blind and Pantaleo opted to check his big blind. They both checked through the whole board. Ikeuchi showed but was beaten by the higher kicker of Pantaleo who held . Hand #165: Ikeuchi raised to 225,000 from the button and Loeser called from the big blind. They both checked through the flop and the on the turn to the on the river. Loeser bet 385,000 and Ikeuchi folded. Hand #166: Loeser completed his small blind but then folded when Ikeuchi raised to 275,000. Hand #153: Manig Loeser received a walk. 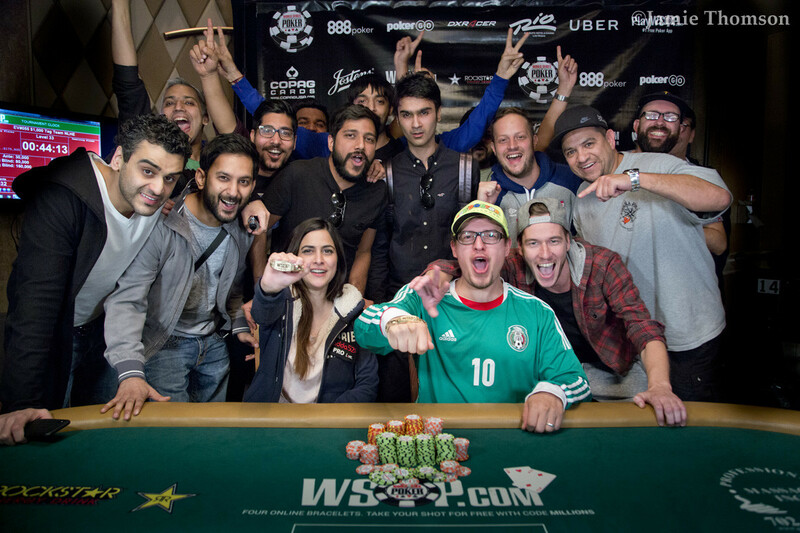 Hand #154: Giuseppe Pantaleo raised to 200,000 on the button and won the pot. Hand #155: Kazuki Ikeuchi called in the small blind, and Pantaleo raised to 300,000 which was enough to get Ikeuchi to fold. Hand #156: Pantaleo called in the small blind, and Loeser checked his option. Pantaleo bet on the flop, and Loeser folded. Hand #157: Loeser called in the small blind, and Hiroki Iwata checked his option. The flop came down Loeser check-called a 100,000 bet from Iwata before both players checked on the turn. Both players checked to a showdown on the river, and Iwata won the pot with for a pair of jacks after Loeser had shown king-high with . Hand #158: Ikeuchi called in the small blind, and Pantaleo checked his option. Both players checked on the flop, and again on the and finally on the river. Ikeuchi showed jack-high, and Pantaleo won with king-high. Hand #159: Pantaleo called in the small blind, and Loeser checked in the big. The flop came along with two checks, and both players checked on the turn. On the river Pantaleo bet and Loeser folded. Hand #160: Pantaleo raised to 200,000 from the button and won the pot. 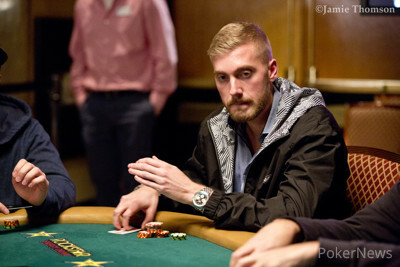 Hand #161: Loeser raised to 225,000 on the button, and Pantaleo called in the big blind. Both players checked the flop before Pantaleo bet a near pot-sized 400,000 on the turn. Loeser took his time to think before ultimately folding. Hand #151: Giuseppe Pantaleo raised to 200,000 from the button and Kazuki Ikeuchi called in the big blind. They both checked through the flop to the on the turn. Ikeuchi check-folded to Pantaleo's bet of 175,000. Hand #152: Manig Loeser raised to 225,000 from the button and Pantaleo called. They both checked through the whole board for Pantaleo to take down the pot with for the flopped pair of eights. Hand #150: Alex Rocha counted out his stack and decided to shove from the button for 1,040,000 in total. Giuseppe Pantaleo looked at his own cards and took some time to consider his options. After a while, Pantaleo also moved all in. Manig Loeser glanced at his own cards and decided to fold. The board ran out to give Pantaleo two pair, aces and queens, to eliminate Rocha and his girlfriend Megan Milburn and her mother Joanne Milburn in fourth place for $55,016. Hand #145: Giuseppe Pantaleo received a walk in the big blind. Hand #146: Kazuki Ikeuchi raised to 175,000 in the cutoff, and Manig Loeser called in the big blind. The board came down , and both players checked every street to showdown. Loeser tabled for a pair of eights and Ikeuchi mucked. Hand #147: Alex Rocha moved all in from the cutoff and won the pot. Hand #148: Pantaleo limped in the cutoff, and Rocha checked his option in the big blind. Both players checked on the flop and again on the turn. On the river, Rocha checked, Pantaleo bet 110,000, and the former folded. Hand #149: Rocha moved all in from the small blind and Pantaleo folded.